Identification: Deep-bodied, olive colored, with darker spots and flecks of red, and occasionally vertical bars along the sides. The hind end of the gill flap is black with a white border and has a red spot on the tip (hence its name). The chest color is yellowish to cream colored.The mouth is small and when closed barely reaches only to the front margin of the eye. The pectoral fins are long and more pointed than those of other sunfish; the first dorsal fin contains 10 sharp spines, followed by 10 to 12 rays. Moyle (1976); Hubbs et al. (1991); Page and Burr (1991); Etnier and Starnes (1993). Lepomis microlophus is composed of two unnamed subspecies; one in Florida, Georgia, and southern Alabama, the other throughout the rest of its range. The two subspecies may no longer be distinguishable due to interbreeding caused by stocking programs (Page and Burr 1991). Native Range: The native range for this species is Atlantic coast of North America (USEPA 2008). Page and Burr (1991) report the range as Atlantic and Gulf Slope drainages from about the Savannah River, South Carolina, to the Nueces River, Texas; north in the Mississippi River basin to southern Indiana and Illinois. Rohde et al. (2009) also conclude that the native range includes the Savannah River in Georgia and extends south through Florida and west to the Rio Grande River, and north in the Mississippi River Valley to southern Illinois and Indiana. Jenkins and Burkhead (1994) cite Bailey (1938) in reporting that the native range on the Atlantic slope may not be any farther north than Georgia. Table 1. States with nonindigenous occurrences, the earliest and latest observations in each state, and the tally and names of HUCs with observations†. Names and dates are hyperlinked to their relevant specimen records. The list of references for all nonindigenous occurrences of Lepomis microlophus are found here. Ecology: The redear sunfish is a molluscivorous species of the Centrarchid family. It lives in vegetated littoral zones of small to large lakes, marshes, and reservoirs, and streams or rivers with sluggish to slow-moving flow (French and Morgan 1995). It prefers the deeper waters of warm ponds, lakes, reservoirs, and swamps, and favors clear water with abundant vegetation and other cover with a substrate of mud or sand (IUCN Redlist, 2013). This species often nests in colonies on the bottom of shallow areas (IUCN Redlist, 2013). Means of Introduction: Intentional stocking for sportfishing. In Iowa, fish found in interior streams are believed to be escapes from stocked lakes (Harlan et al. 1987). The species' recent (1991) discovery in Vermont is somewhat of a mystery. It appears the most likely means of introduction there is stock contamination of privately stocked Micropterus (Whittier and Hartel 1997). Status: Established in most locations, but extirpated in New Mexico (Sublette et al. 1990) and Utah (Sigler and Sigler 1996). The Delaware population at Wagamons Pond was discovered in October 1994 (Raasch, personal communication). Not established in Missouri (Pflieger 1997). Established in at least one of the two lakes in Vermont (Whittier and Hartel 1997). Results of a 1995 survey show that redear natural reproduction has been highly successful in Clear Lake in Jackson County, MI (Herman 1996). Impact of Introduction: Redear is highly molluscivorous. Direct impacts on invertebrates and indirect impacts on vegetation are associated with L. microlophus in Tennessee (Ruiz et al. 1999). In inland lakes of southern Michigan, introduced redear is associated with ecological changes in populations of pumpkinseed L. gibbosus, a native molluscivore. Effects of introduced redear on pumpkinseed include reduced consumption of snails and reduced population densities (Huckins 1997). The effects appear to be driven by differences in pharyngeal morphology and competitive ability; redear exert greater crushing forces and consume more snails than sympatric pumpkinseeds (Huckins 1997). When introduced into a water body, Huckins et al. (2000) found that competition between the two species resulted in a 56% reduction in pumpkinseed abundance, and a 69% reduction in average snail biomass when compared with lakes without redear. Hybridizes with other Lepomis species (Scribner et al. 2001). Remarks: Robison and Buchanan (1988) reported redear sunfish as widely stocked in Arkansas in ponds and reservoirs, presumably in native waters. Menhinick (1991) listed this species as "regarded as native but possibly introduced" and "introduced" into the Catawba, Yadkin, Lumber, and Waccamaw drainages. Stauffer et al. (1995) differed with other authors (Lee et al. 1980 et seq. and Jenkins and Burkhead 1994) in reporting this species as native to the Potomac, Big Sandy, Kanawha, and Little Kanawha drainages, and Ohio basin. No records exist for New York (Whittier and Hartel 1997). 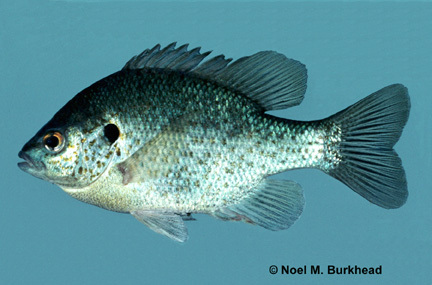 Redear, and to a lesser extent pumpkinseed, are the only known morphologically and behaviorally specialized molluscivores in the sunfish family (Huckins et al. 2000). The ability of these sunfish to crush hard-shelled organisms provides a set of food resources that are less effectively used by other sunfishes, facilitating cohabitation with other sport fish such as bluegill and bass (VanderKooy et al. 2000). Bailey, R.M. 1938. A systematic revision of the centrarchid fishes with a discussion of their distribution, variations and probable interrelationships. Unpublished Ph.D. dissertation. University of Michigan, Ann Arbor, MI. Bettoli, P.W., and P.W. Clark. 1992. Behavior of sunfish exposed to herbicides—A field study. Environmental Toxicology and Chemistry 11(10):1461-1467. Burr, B.M., and L.M. Page. 1986 . Zoogeography of the fishes of the Lower Ohio-Upper Mississippi basin. 287-324 in C.H. Hocutt and E.O. Wiley, eds. The zoogeography of North American freshwater fishes. John Wiley and Sons, New York, NY. Cooper, E.L. 1983. Fishes of Pennsylvania and the Northeastern United States. Pennsylvania State University Press University Park, PA. 243 pp. Cross, F.B., and J.T. Collins. 1995. Fishes in Kansas. University of Kansas Natural History Museum. Eller, L.L. 1969. Pathology in redear sunfish exposed to hydrothol 191. Transactions of the American Fisheries Society 98(1):52-59. Erdsman, D.S. 1984. Exotic fishes in Puerto Rico. 162-176 in W.R. Courtenay and J.R. Stauffer, eds. Distribution, biology, and management of exotic fishes. John Hopkins. Baltimore and London. French, J.R.P., and M.N. Morgan. 1995. Preference of redear sunfish on zebra mussels and rams-horn snails. Journal of Freshwater Ecology 10(1): 49-55. Grabowski, S.J., S.D. Hiebert, and D.M. Lieberman. 1984. Potential for introduction of three species of nonnative fishes into central Arizona via the Central Arizona Project - A literature review and analysis. REC-ERC-84-7. Ghent, A.W., and A.B. Grinstead. 1965. A new method of assessing contagion applied to a distribution of redear sunfish. Transactions of the American Fisheries Society 94(2):135-142. Harlan, J.R., E.B. Speaker, and J. Mayhew. 1987. Iowa Fish and Fishing. Iowa Department of Natural Resources. 323 pp. Herman, M.P. 1996. Status of the fishery resource report: Clear Lake. Michigan Department of Natural Resources 96-1. Horak, D.L. – Colorado Division of Game, Fish and Parks, Fort Collins, Colorado. Huckins, C.F.J. 1997. Functional linkages among morphology, feeding performance, diet, and competitive ability in molluscivorous sunfish. Ecology 78(8):2401-2414. Huckins, C.J.F., C.W. Osenberg, and G.G. Mittelbach. 2000. Species introductions and their ecological consequences: An example with congeneric sunfish. Ecological Applications 10(2): 612-625.
Insider Viewpoint. 2001. Fishing Records - Nevada. Insider Viewpoint Magazine. 3 pp. IUCN. 2013. IUCN Red List of Threatened Species (ver. 2013.1). Available at: http://www.iucnredlist.org. (Accessed: 16 April 2019). Jenkins, R.E., and N.M. Burkhead. 1994. Freshwater Fishes of Virginia. American Fisheries Society, Bethesda, MD. 1079 pp. Kolar, C.S., and D.M. Lodge. 2002. Ecological predictions and risk assessment for alien fishes in North America. Science 298:1233-1236. Logan, D.J. 1994. A checklist of the fishes of Benton County, Oregon. American Currents (A Publication of the North American Nativ 1994(Summ):16-18. Martin, T.H., L.B. Crowder, C.F. Dumas, and J.M. Burkholder. 1992. Indirect effects of fish on macrophytes in Bays Mountain Lake: evidence for a littoral trophic cascade. Oecologia 89(4):476-481. McCollum, E.W., L.B. Crowder, and S.A. McCollum. 1998. Complex interactions of fish, snails, and littoral zone periphyton. Ecology 79(6):1980-1994. Melwani, A.R., S.N. Bezalel, J.A. Hunt, J.L. Grenier, G. Ichikawa, W. Heim, A. Bonnema, C. Foe, D.G. Slotton, and J.A. Davis. 2009. Spatial trends and impairment assessment of mercury in sport fish in the Sacramento-San Joaquin Delta watershed. Environmental Pollution 157(11):3137-3149. Miller, R.R., and C.H. Lowe. 1967. Part 2. Fishes of Arizona. In: C.H. Lowe, ed. The Vertebrates of Arizona. University of Arizona Press, Tucson, AZ. pp. 133-151. Pflieger, W.L. 1975. The Fishes of Missouri. Missouri Department of Conservation. 343 pp. Pickhardt, P.C., M. Stepanova, and N.S. Fisher. 2006. Contrasting uptake routes and tissue distributions of inorganic and methylmercury in mosquitofish (Gambusia affinis) and redear sunfish (Lepomis microlophus). Environmental Toxicology and Chemistry 25(8):2132-2142. Powers, S.L., and P.A. Ceas. 2000. Ichthyofauna and biogeography of Russell Fork (Big Sandy River - Ohio River). Southeastern Fishes Council Proceedings 41: 1-12. Raasch, M.S. – DuPont Experimental Station, Wilmington, Delaware (retired). Red River Authority of Texas. 2001a. Red and Canadian Basins Fish Inventory: Cottle County. Red River Authority of Texas. Red River Authority of Texas. 2001b. Red and Canadian Basins Fish Inventory: Red River County. Red River Authority of Texas. Rinne, J.N. 1995. The effects of introduced fishes on native fishes: Arizona, Southwestern United States. Pp. 149-159 in D.P. Philipp, J.M. Epifano, J.E. Marsden, J.E. Claassen, and R.J. Wolotina, Jr. (eds. ), Protection of aquatic diversity. Proceedings of the World Fisheries Congress, Theme 3. Oxford & IBH Publishing Company, New Delhi. Robison, H.W., and T.M. Buchanan. 1988. Fishes of Arkansas. University of Arkansas Press, Fayetteville, AR. Rohde, F.C. – NOAA National Marine Fisheries Service, Southeast Fisheries Science Center, Beaufort, North Carolina. Rohde, F.C., R.G. Arndt, J.W. Foltz, and J.M. Quattro. 2009. Freshwater Fishes of South Carolina. University of South Carolina Press, Columbia, SC. Ruiz, G.M., P. Fofonoff, A.H. Hines, and E.D. Grosholz. 1999. Non-indigenous species as stressors in estuarine and marine communities: assessing invasion impacts and interactions. Limnology and Oceanography 44(3): 950-972. Saiki, M.K., B.A. Martin, and C.N. Alpers. 2005. Total mercury concentrations in fillets of bluegill, redear sunfish, largemouth bass, and other fishes from Lake Natoma, Sacramento County, California. California Fish and Game 91(3):193-206. Smith, J.J. 1982. Fishes of the Pajaro River System. Pages 83-170 in P. B. Moyle, J. J. Smith, R. A. Daniels, T. L. Price, and D. M. Baltz, editors. Distribution and ecology of stream fishes of the Sacramento-San Joaquin drainage system, California. University of California Press, Berkeley, CA. Sommer, T., B. Harrell, M. Nobriga, R. Brown, P. Moyle, W. Kimmerer, and L. Schemel. 2001. California's Yolo Bypass: Evidence that flood control can be compatible with fisheries, wetlands, wildlife, and agriculture. Fisheries 26(8): 6-16. Sorensen, E.M.B. 1988. Selenium accumulation, reproductive status, and histopathological changes in environmentally exposed redear sunfish. Archives of Toxicology 61(4):324-329. Underhill, J.C. 1986. The fish fauna of the Laurentian Great Lakes, the St. Lawrence Lowlands, Newfoundland and Labrador. Pp. 105-136 in C.H. Hocutt, and E.O. Wiley, editors. The Zoogeography of North American Freshwater Fishes. John Wiley and Sons, New York, NY. Vanderkooy, K.E. , C.F. Rakoginski, and R.W. Heard. 2000. Trophic relationships of three sunfishes (Lepomis spp.) in an estuarine bayou. Estuaries 23(5): 621-632.